Found on a snake, adjacent bands of red and yellow call for caution. Found on a branch, adjacent splashes of red and yellow are pure pleasure. Here, an opening bud and spent flower show off the glorious colors of Mexican primrose-willow. Their yellow flowers and red-touched stems, buds, and sepals provide a first touch of traditional autumn color, and prove that petal-peeping can be as satisfying as leaf-peeping. I’m not sure I’ve ever seen this flower. Any place you can recommend that it grows wild, unmowed? Brazoria NWR perhaps? Great article you linked. We see a coral snake roughly once per year, but they are keen to move away from us quickly. I personally think ALL snakes as friends of Jack. I don’t know your area, but in central Texas this species is common at the edge of ponds and in wetlands in general. Now that you’re aware of it, I’ll bet that if you check out several wet areas you’ll find it in at least one. 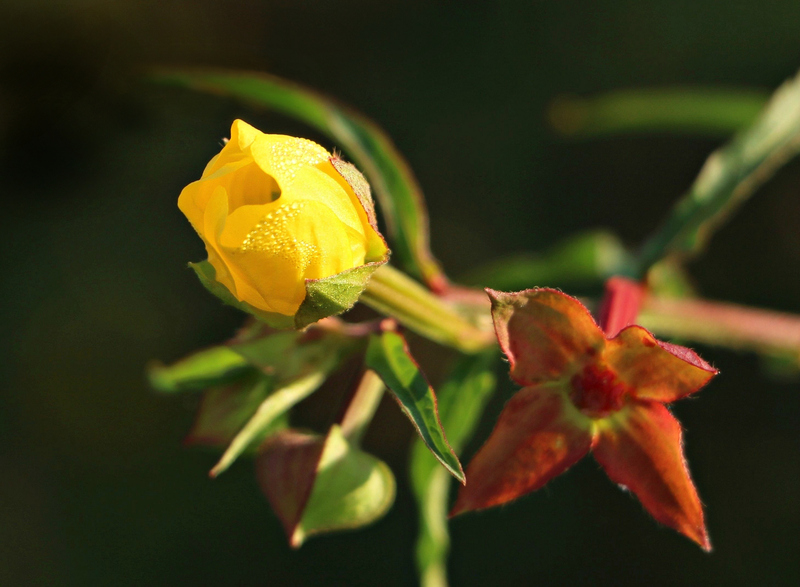 A good half-dozen other species of Ludwigia also grow in southeast Texas. Strange as it may seem, I’ve never seen this at a refuge or prairie: not at Brazoria NWR, not at Armand Bayou, not at Nash, not at Anahuac. The first time I found it was along US 71 between El Campo and Danevang, on the west side of the road at a junction with a Farm-to-Market road. I’ve found it in a culvert by a stop sign in Palacios, in a ditch along Algoa-Friendswood Road south of 517 and east of Alvin, in this field near the Hall’s Bayou fishing camp, and in a ditch behind the Kemah Aldi’s grocery store. There’s a pattern here — I just can’t quite figure out what it is. It clearly doesn’t like a true coastal environment — salt water probably doesn’t suit it — but it’s pretty widely spread, and not very fussy. I’d say keep your eyes on the ditches, wherever there tends to be standing fresh water or at least moist soil. It’s not as rare as I’d thought. I liked that article for any number of reasons: including some of those beautiful snakes that I’d never heard of. And what do Palacios, El Campo, Danevang and certain areas of 2004 have in common? Rice production. Look around ditches in rice country, and I’ll bet you can find it. Glad you liked our article, Shannon. And even happier that you respect and see value in our slithery pals! Some of them may have the ability to harm us, but as you’ve experienced, they would much rather avoid us. Any friends of snakes, are definitely friends of ours. Thanks!! Come to think of it, I like the name “primrose-willow,” and now that I’ve said it out loud a few times, I like “Ludwigia octovalvis” a lot, too! Ludwigia sounds to me like a female German musician, and octovalvis sounds like a strange musical instrument: maybe a cross between a harmonium and a bagpipe. Your mention of the name did send me on a bit of a search, and now I’m pretty sure that octovalvis refers to eight folds around the plant’s pod. More research is required! :) That’s a great name for an instrument! Ok, Ludwigia is playing “Octopus’s Garden” on her octovalvis for Oktoberfest. Perfect! Everyone likes “Octopus’s Garden! :) Haha! You were right, that’s great! And I love Pogo, I have a lot of the strips in books. This is the first time I’ve thought of petal-peeping. For those of us who don’t have those splendid autumn displays of leafy color, and aren’t able to travel to see them, it could help to ease our frustration. Lovely photo–I like your comparison of the colors on the snake versus those on the plant. I can’t hear the phrase “red and yellow” without thinking about coral snakes. That little jingle was one of the first things I learned when I moved to Texas. I’ve only seen a couple in all the years I’ve been here, which supports their reputation as shy and retiring. The plant, on the other hand, certainly makes its presence known! Oh, how lovely!! Thank you, Linda, for coming back to show us this beauty in full splendor. I’m glad to see that Fall is starting to show up in your area. When a hurricane blows through, too often the trees and landscape are changed for a time. How resilient Mother Nature is! Ah, but this isn’t exactly the flower’s full splendor, Debbie! There’s one more photo in the series that I think you’ll like even more. I happened across a post from Texas Parks and Wildlife that said the oak trees — and the Big Tree — that were stripped of their leaves in Rockport are starting to put on new growth. It is amazing how quickly the recovery comes. Now, it’s Louisiana and Mississippi’s turn — perhaps Alabama and the Florida Panhandle, too. I think I remember that you still have family in Mississippi. If you do, I hope they’re spared any effects. This one seems to be moving quickly, but it still won’t be any fun. You remembered — thank you! We’ve talked to many of my kin and they’re fine, thankfully. A lot of wind, a lot of rain. Probably helped that Nate was whipping along at a good clip. I’ll look forward to the third part of this flower! I’m so glad. I couldn’t believe it when I read how fast the storm was moving. That storm surge is going to be a mess to clean up, but at least the destruction should be minimal — and now it’s gone. It could be in Nova Scotia by now! My radar shows it as a nasty spiral over Ohio, West Virginia, and the Carolinas. But yes, it’s flying through; maybe it will help those places that are having a drought. Beautiful plant with an interesting transition in color. Isn’t it fun to see a plant that doesn’t immediately turn brown as it ages? White to pink, or blue to lavender, seem fairly common, but yellow to red is quite a striking change. It seems especially vibrant this year: no doubt because of the extra dose of water. You are welcome, Linda. What a beautiful little moth. It looks very similar to one of our Pyralidae, and one of our Pyrausta. Thanks to you, I suspect I might have found Pyrausta tyralis. It’s even more beautiful than I realized, and there are several sightings in my neighborhood listed on iNaturalist. The wingspan there is listed as 17mm, so my estimate wasn’t badly off. Thanks for the suggestion! It seems it’s getting a little late in the year for it, but perhaps I’ll find another next year. It is great you got the id! I love these little moths which are often overlooked. Our Mint Moth is very similar and from the same family and genus, and can be seen quite happily flying around in the daytime here around the foodplants, my garden and water mint. Plants do seem especially willing to sit for a portrait, although those vexing breezes can make them squirm a bit. I did have trouble getting one shot I wanted — straight into the heart of an opening bud — because I couldn’t get everything in focus. If the petals were sharp, the inside wasn’t, and vice-versa. The good news is i can try again, and I don’t have to travel so far to do it, since I found some of these beauties along the Kemah road that runs between the back of Home Depot and Aldi’s. I’m still chuckling over that photo. A sofa never looked so life-like. There is nothing more sane and wholesome than the primrose- willow. I could happily spend time in its contemplation and feel utterly safe. I think the plant would return your regard, Gerard. It seems it can be found rather easily in Queensland, and there are other members of the genus around Sydney, so contemplation might be possible. Perhaps a little water garden’s in order. At least the plant thieves might leave them alone there. That is quite a beauty that you have photographed. I really like it. I wish those grew here. I think the Flower Fairy must have heard your wish, Yvonne. The USDA map shows the plant in McLennan County. You might be able to get it established, since it likes water, but is drought-resistant. Here’s a plus: it’s said to be quite attractive to butterflies. If you want, I’ll try and get some seeds for you. It shouldn’t be too hard, since there were quite a few substantial plants where I took the photo. Seeds would be wonderful but only if you are going that way and it is not too much effort. Thanks for thinking of me. They are beautiful flowers. Have you ever seen this one? It seems to be fairly widely distributed around your country, from NT and Queensland to Sydney and Melbourne, so you might run across it. Our most famous one is pink. It prefers drier areas, but it’s a first sign of spring: a reflection of its name, which means “first rose.” It’s wonderful to see great colonies of it overspreading the hills and roadsides. It’s no wonder the primrose path seems so attractive! No I’m not familiar with this plant at all, possibly because I’ve spent more of my life in SA which tends to be drier generally than NT and QLD etc. 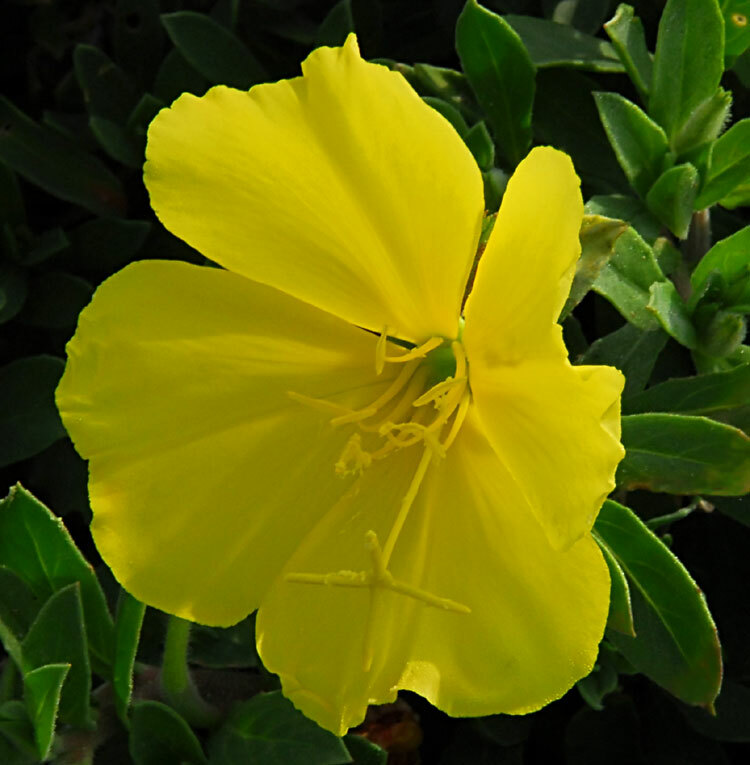 The Oenothera is one I am familiar with, both the yellow forms and the pink one. I am enjoying learning about your country — and am surprised by the number of plants we share. It’s something to contemplate, that certain of our natives are considered invasive in other parts of the world. It makes perfect sense, of course. I just never had thought of it. As Australian plants are causing issues in foreign lands. What goes around comes around. Pure pleasure to me, too. This is a flower I’ve never seen before. I can see why you were enchanted. The combination of red and yellow reminds me of your painting, for some reason. They’re such bright, clear colors: almost tulip-like. Now that I think of it, that might be one of the reasons I like them. We always planted tulips when I was growing up — the brighter, the better. Your red and yellow allusion brought back the memory of my aunt telling a very much younger me how to tell the difference between a coral snake and a king snake with the old rhyme — words of wisdom as they had spotted several coral snakes on the acre where they had the “pink house” which was hay storage and shelter for my cousin’s horses, Smoky and Baby. This property was her “cut” of her mama’s property on the old Yost Road. If you’d known it then, you wouldn’t know it now. Since it was near Clear Creek, there might have been some L. octovala about. When the octopus with the garden wandered into the conversation above, I thought of Walt Kelly’s storied octopus who fell in love with a bagpipe. It was an unignited love. In despair the octopus got a job in vaudeville as a string quartet, but the act fell flat on its octameter because it didn’t have a leg to stand on. There very well could have been Ludwigia about. In fact, there very well could be. I haven’t been over to Froberg’s recently. I may make a run this week and take the back way, just to see what I can see. I did discover there’s a new (?) farm and bakery over there called the Funky Monkey. I’d never heard of it, but they have quite a nice page, and they’re near Froberg’s. They’re closed for the rest of this year, having received 34″ of rain during Harvey, but it will be worth checking out next season. Can you hear me laughing? I didn’t know about the octopus in Pogo, or I’d forgotten. I love that. The string of puns in your comment’s not bad, either. Well the colors are indeed lovely and very autumnal plus I love the title Breaking Bud. You have a funny way of playing off familiar literary lines or TV shows…like Breaking Bad!! Makes me laugh!! My day is complete! I kept thinking, “Surely someone is going to catch that title.” To be honest, I’ve never seen a single episode of the show, but when thoughts of the bud breaking open came to me, it didn’t take long for “Breaking Bud” to become the title. I’m glad it gave you a laugh. It certainly amused me, but I tend to laugh at my own jokes, anyway. Too funny. I do the same and I always feel mildly disappointed when my humor doesn’t elicit the intended response….especially when I know its good!! :) Well pretty sure!! I haven’t watched the show either I just like the sound of the title. Sometimes, the sound is enough. Puns, wordplay of every sort — it’s really great fun. And our flower most commonly called “evening primrose” is pink. There is another primrose that grows on the beaches that’s wholly yellow. It’s a bit larger, too, and really delightful. It’s called, reasonably enough, the beach evening primrose . They’re all quite beautiful. Pure pleasure, indeed, Linda. Thanks for linking to our article! My pleasure! It can be easy to link to a Wiki page, but I try to find quality pieces for any interested readers. Yours fit the bill perfectly, and I learned a good bit myself. Thanks for the effort you put into your work. yikes! before i typed this comment, i searched for images of ‘ecuadorian coral snakes’ – as the red and yellow/kill a fellow ‘ does not always apply here.. so here’s one example of an exception to that rule! lovely image, much friendlier than the snake in the video! i did not realize that coral snakes had such a nasty temper! Yours looks as though he’s trying to tie himself into knots. It was interesting to see the variety of coral snakes in the article I linked — yours was included. They’re all rather beautiful but, as you say, not all seem quite as non-combative as our local variety. I’ve seen more snakes this year than I ever have before: three water snakes, one rattler, and two that I couldn’t identify that were headed, lickety-split, away from me. Still, everytime someone sees me wandering around, I get a warning to watch for the snakes, so they’re clearly about. I use the same rule we used in Liberia — walk hard and make noise. Let them know you’re coming, in other words. That’s not a bad idea. I know people who’ve done that with raccoons, particularly. There’s nothing like color-coding your varmits to keep track of them!